During my first visit to New Zealand’s South Island I took a trip on the TranzAlpine train from Christchurch. Most people don’t do any research and book the train as a return full day journey from Christchurch to Greymouth and back again. Don’t waste your money on this! Greymouth is a boring place. The best views are between Christchurch and Arthur’s Pass at the height of the mountains and these tickets are much cheaper. The full day trip ticket costing often over $NZ200 Adult fare Christchurch to Greymouth return is a colossal rip off, the cost for a family with parents and children is way too much. Families will find much more value doing other truly unique activities on South Island like the Fox Glacier Helihike. Perhaps I feel this strongly because I’ve seen so much better scenery when travelling by road in the more remote parts of South Island like Mount Cook, because other people on the train were much more excited than me taking photos by the dozen of fairly mundane scenery along the way. I suspect that taking the Tranzalpine train trip when there was still snow on the ground would be more interesting visually rather than during summer. If you’re short of time during your New Zealand trip so you can’t drive across the mountains, catching the TranzAlpine train to Arthur’s Pass and back again to Christchurch a few hours later is worth considering. 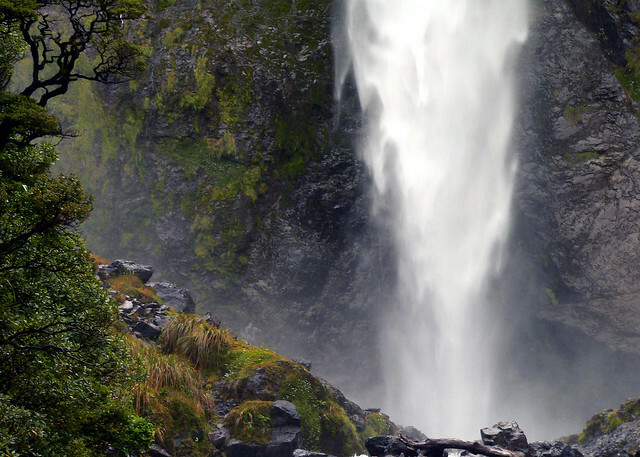 The township of Arthurs Pass is a good base for trampers with various walks starting there. Independent travellers would probably be better off catching a bus or driving to Arthur’s Pass to go tramping and hiking with plenty of time to spare. 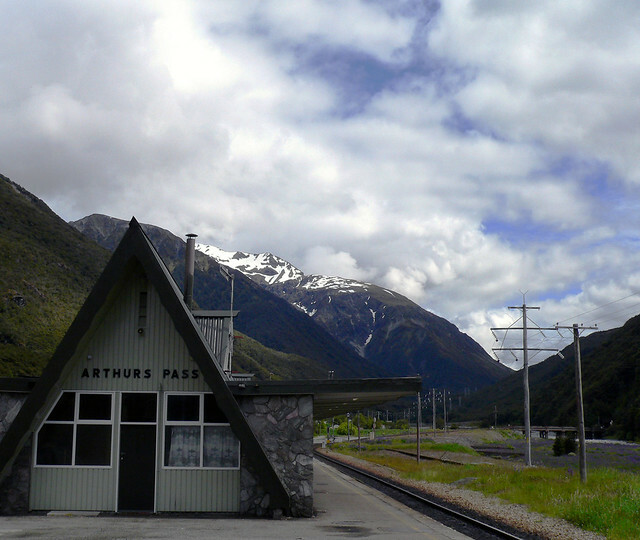 I had 5 1/2 hours time to spend in the Arthur’s Pass before the train returned to take me to Christchurch. 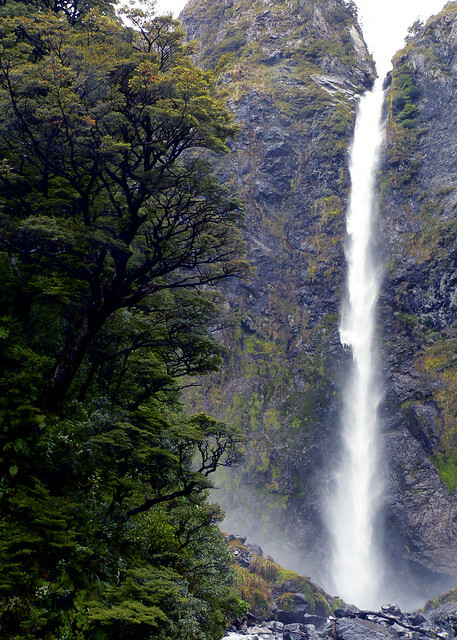 I took the opportunity to do the Devils Punchbowl Walking Track to see one of New Zealand’s best waterfalls. While not a long walk be aware that it is a bit of a climb gaining altitude so if you can’t climb lots of flights of stairs in a building this walk is probably too much for you. If you have a car/auto club membership like NRMA or RACV make sure you book your train tickets using the discount codes provided on the Kiwi Rail Tranzalpine website and take your car/auto club member card with you to New Zealand to show you are eligible for the cheaper ticket. However, I hate to feel I’ve wasted my money, so if I ever make it to NZ, I’ll remember not to go on this TranzAlpine train. I agree with you totally. I am from NZ and travelling by train to Greymouth is very dull. The best parts of the Southern Alps simple can not be seen from the inside of a train. One needs to get out and go hiking to see the amazing scenery. 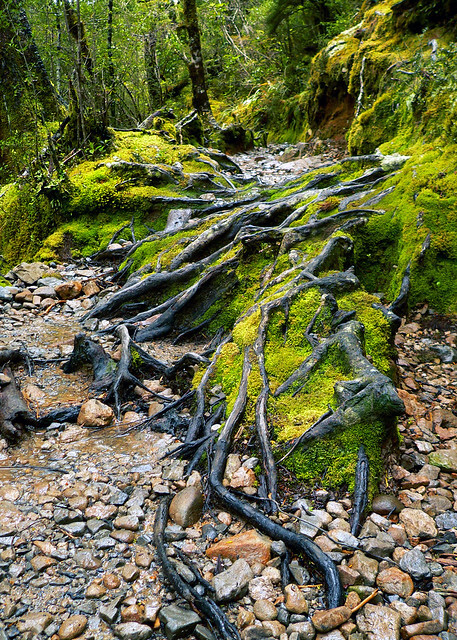 And I agree with your comment about Arthur’s Pass, it is a great base for some good hiking (tramping). I think there needs to be some sense of perspective to this. There are many visitors to NZ (including from as near to us as the other side of the Tasman) who will perhaps never see that aspect of the Southern Alps discussed here by Neerav Bhatt and blair, and who would never expect to. They are happy to experience the condensed diversity of scenery for which NZ is internationally renowned and the ‘long-distance’ views of the gorges, the mountains (including snow! ), and the railway infrastructure that conquered them. They are also happy to do it from the comfort of a warm/cool comfortable train seat, replete with commentary. One might expect that most of these would view the fare as money well spent, and perhaps the international reputation of this trip as an iconic journey attests to this..? I would counsel prospective overseas visitors who have a limited time in which to see NZ to seriously consider this train journey as a must-do! The Transalpline is a great train journey – you simply can’t access the areas or views by a bus – train is the only way, and hiking is very strenuous and not without costs either (not to mention time consuming!) Myself and my family enjoyed the trip immensely from the comfort of our seats and it was a moemrable part of our journey through the south island. It’s all a matter of what you prefer, but you should be able to get a cheaper ticket if you plan ahead. Running a train through remote scenic highlands doesn’t sound like a low cost endeavour to me. I booked a ticket over the internet on the tranzscenic from what I thought was the actual homepage of Tranzscenic rail. It turns out I purchased from an agent and payed almost double the actual price. It seems Tranzscenic allow their agents to charge what they like – I would accept an agents mark up of ten or maybe even 20% percent. I did not realize I was purchasing from an agent until I had made payment. The agents site does not give any indication that it is anything but the authentic homepage of Tranzscenic rail. Im very dissapointed to have paid almost double what other people on the train paid and I had a terrible seat. This is the type of scam you would expect when travelling in a third world country. When I finally have the chance to visit New Zealand I will definitely take your advice and avoid the Tranz Alpine Train. Enjoyed the hand painted map of Arthurs Pass. Thanks for sharing. Nigel from Tranz Scenic here. Hope you don’t mind me commenting. The TranzAlpine has cemented a reputation over many years as being one of the top train journeys in the world. The feedback we have had from the hundreds of thousands of passengers a year is almost as good as the views themselves. You’ll know what I mean when you hear a carriage full of passengers gasp out loud as the train leaves a tunnel and travels high over the Waimakariri River gorge. The train also treats passengers to views you wouldn’t get another way – it often travels where the roads and tracks don’t go. It is obviously not to everyone’s taste, but is very affordable especially if you book direct on the Tranz Scenic web site as there are special low cost fares available. A number of travelers go from Christchurch to Arthur’s Pass, go tramping for a few hours, then get the train back later the same day, for far less than the prices mentioned above. Views are especially good at the moment, with low snow down to the tracks at places like Cass (the little red station made famous by the Rita Angus painting). Maybe I’m biased, but any of the scenic train journeys in New Zealand (the TranzAlpine, TranzCoastal and Overlander) are well worth it. This train sounds exciting especially for people who live in countries where trains are rare/expensive. I am planning a trip to the south Island from the U.S and I was hoping to take at least 1 leg of the TranzAlpine but the prices are so high inspite of the “winter sale”. So there are some great deals but not available to people booking from outside NZ . KiwiRail, this is unfair that the great fares are not allowed for people who really want to book them. Considering the bus/shuttle charges about N$35, asking for N$200 for Cch- Greymouth is a rip off, especially during winter. The negative comments are so wrong …You should not be so negative as to put other people off from doing something . What maybe boring and dull for you may not be for some one else . New Zealand is a great place and has amazing scenery and yes you do need to get off the main routes to see the real beauty but dont post negative things unless it is really a rip off. Ill be doing as mant train trips as I can….. can anybody give me some hints on what trips there are steam etc… thanks Greg..
hey KiwiRail any ideas on rail travel??? Hi, Nigel from KiwiRail here again. While it is true that you might find cheaper travel, it is not the same thing. For one, Desi Girl’s post ignores that facts that the shuttle price is one way, the train fare (not completely accurate) a return and fully refundable. What’s more, the train is far more than mere travel – time and again international research has proved that people much prefer to travel in the air conditioned, smooth comfort of a train. The TranzAlpine also has open air viewing carriages so you can take photos (or video) without reflection from glass windows and move from one side of the train to the other to get the best view. You’ll need to wrap up warm in winter, but it is a popular part of the train. Train travel is a travel experience unlike any other. Well said, Nigel. Some people are either very “sad” or spoilt. The negative comments about the trip seem to reflect this. My wife and I did the trip in July just after a snowfall. It was stupendous! As for finding alternative ways to see the scenery, there certainly are some. I have tramped and low-level climbed in parts of the Southern Alps and spent years in Search and Rescue there. I have also been to Greymouth by road. NOTHING about the road trip can compare with the fantastic scenery experienced from the train. I would, however, suggest that winter is the time to do it. Part of the appeal in the trip is standing in the observation car and taking photos in -8 degrees windchill and sharing the experience with peole you have never met. If that doesn’t appeal, then stay inside the carriage or stay home. But my in-laws have done the trip in summer and would do it again! I guess everything is in the eye of the beholder. My family and I travelled on the TranzAlpine in 2007 and loved the journey. We may have been able to do it cheaper by bus but, quite frankly, you couldn’t pay me enough money to do a trip like that in a cramped bus. We may have got closer to the scenery by hiking, but not so practical with a four year old in tow. We enjoyed the views from the train, and what is more the train was comfortable, lots of leg room, huge windows to look out of, buffet on board etc. I quite enjoyed braving the elements on the observation deck too, even though I’m not convinced putting it in the middle of the train is the best place. PS Stumbled across this blog while planning for a Christchurch-Auckland trip by rail to be undertaken next year! Sorry, disagree. Trans Scenic New Zealand offers a spectacular train ride from Christchurch to Greymouth over the Southern Alps. See this hubpage on the topic http://hubpages.com/hub/Tranz-Scenic-New-Zealand. Neerev Bhatt, what a one sided view. I’ve been on this train twice and sure, if you sit in the carriage and stare out the window it can be a bit soul destroying. But hey , get out on the open air carriage and feel the breeze, smell the air and enjoy the scenery. I think the best scenery is from Arthurs Pass anyway so do’t whine just about the route from greymouth only half way. You’re fortunate if you’ve seen the rest of the southern Alps. Some people aren’t and to have small window of opportunity to experience this wonderful part of NZ is a rare experience. Grant them that at least and we’ll accept that your comments were your opinion and we don’t all agree with you. EDITOR: I accept your point. Everyone experiences a place differently. In a number of posts, people have complained of purchasing a ticket from an agent instead of directly at TranzScenic website. I am planning to purchase 2 tickets for July. Does anyone know if this is the correct site – http://www.tranzscenic.co.nz/ ? They don’t have any specials for winter. The price is $160 pp. Any ideas on how to get a cheaper fare? Hi, Nigel from KiwiRail here again. Yes, SG, you have the right web site. It’s possible to get them one way for around the $150-$155 mark. A little cheaper. Peoples…If you wont something to survive then you have to be prepared to pay for it .Things like this have to charge a reasonable price to cover costs and make a bit extra for upgrades and maintenance.The Trans Alpine train is a great way to see the country.Get out and smell the roses .Have a positive attitude and an adventurous spirit.Life is to short to be negative . I travelled on the Tranz Alpine last year when I visited from the UK when it must have been the wettest day possible. The week before, a coal train had come off the tracks, the wreckage of which we passed on the way. I agree it was expensive for what it was, although it is described as a train trip to take! When you live in the centre of London, the opportunity to see some of the South Island from another angle was very enjoyable as I spent most of the time in the observation-car taking photos by the thousand! Maybe you should be charged less if that is where you travel, although you have to exit the car when you travel through the tunnel! Greymouth in 50 minutes in the pouring rain is not the most exciting place to be, but taking things into account, I enjoyed the trip, and the photo opportunities on the way! This year I will be on the Overlander, so looking forward to that! And if you really want to know what UK railway enthusiasts think of both rail trips get yourself a copy of August and September’s 2010 edition of the UK “The Railway Magazine” and you will see how well both trips were rated!!! What bloody rubbish! We have done Tranzalpine many times and it is always satisfying no matter what the season. I speak from rail experience having also travelled Trans-Siberian. It is okay perhaps for you tramping people but spare a thought for those of us less fit, and also try a liottle positive thinking! I’ve lived in Australia for over 20 years but spent part of my childhood in Greymouth and 12 years in Chch after that, so I know the train and road trips very well. There’s no doubt that the train trip is really great in Winter, especially if there’s a lot of low level snow, but in summer I’d prefer to drive. I last did the train trip in 2009 and noticed the pricing scam whereby overseas internet users visiting the website were blocked from getting the cheap fares. I just got my sister in NZ to buy them for me at the cheap price. Not smart marketing Nigel from Kiwirail!! We’re planning another visit this coming winter and if there’s a reasonable discount to the standard fare, we’ll do the trip again. Have to see how badly damaged my beloved Chch is. i think the key point here is the cost. I booked my transalpine ticket online for NZ$164 for a one way trip from Greymouth to Christchurch, and i booked it from the official website (http://www.tranzscenic.co.nz/). There is only this price provided for me and so, i thought that was the only and standard price. Imagine my dismay when i reached newzealand and I found out that there are NZ$55 tickets available for my journey. Luckily I managed to speak to a staff from Transalpine and downgrade my ticket accordingly. How come the official website does not state that there are different prices for the train, and it gives the misleading information that there is only one price (NZ164) for a one way trip from Greymouth to Christchurch? Is this a way to try to get more money from tourists? Hopefully Nigel can respond to this. In general, this train ride is good and worth it. There are plenty of scenery around. for NZ55, I would do it again. For NZ164, probably not. Your Q to Nigel is riht on the money! I’m now wondering what the benefit is of booking in advance? Will I be guaranteed a seat? If not why bother, just wait till you get there and get a cheaper rate. Come on Nigel, how about a response? Just to update my post in April, I did indeed take the train trip from Greymouth to Chch in late July. Rather than pay full price via the website, I emailed Kiwirail and asked if they had any cheap unadvertised fares available. Sure enough, I was able to score seats at $85. The trip was excellent, the carriage we were in had been updated since I last travelled, and the guy who gave the running commentary during the journey (I think his name was Charlie) was fantastic. Bottom line – definitely do this rail trip if you’re visiting the area, but email them for discount fares first. We visited last month and had a great time on the train, with beautiful scenery. Slightly marred by a rude member of staff. I made comment last August 2010 (See No:22) and have since travelled on the Overlander from Hamilton to Wellington, so no comparison there! I agree the fare for the trip Christchurch to Greymouth is excessive, no more so now that the NZ$ against the UK£ is poor. But one thing I was not aware of was the fact that when I went to book that Overlander trip on the Internet from the UK, there was no fare price for a senior citizen, which I am! So I phoned KiwiRail from the UK, and was told the price as they do not put that on the website, and the ability to book it online!! When I was told the price, it was a steal, so maybe if KiwiRail does alter its pricing policy on the Internet, maybe more senior citizens from NZ & abroad may take either trip, whether you want to argue if its the best trip you have ever made or not! If the same policy on pricing was adopted in the uk, with a disadvantage to senior citizens able to book a fare that is not available online, it would be regarded as an infringement of Human Rights!! Re Alan’s comment. Perhaps the reason the senior’s fare is not on the internet is because Kiwi Rail is a government owned business paid for through NZ taxes. The NZ seniors have paid into the tax system which has paid for the railway and this is a subsidised rate not available to non residents. The same applies in other countries although I’m not sure about the UK. But as a tax payer in NZ I’m more than comfortable with NZ Seniors getting a deal to ride the rails over and above what tourists would pay. On UK Sterling the normal fare is still a pretty good deal. Re: Steve’s Commets No:31. It may well be that Kiwi Rail is government owned, but I bet that they are glad that visitors to NZ keep it going for the residents, after all, The Overlander was shut down, but due to pressure from visitors, me being one of them, they reinstated the service, I am pleased to say! You stated that the senior fare was not available to non residents, yet when I phoned to book the fare, the Kiwi Rail member of staff was well aware I was not a resident as I paid in GB pounds! I looked up the fare for September on this trip and at the NZ$ to UK£ rate it came in at £114.00, which is a lot of money for any UK visitor flying to NZ at the moment. If I was travelling to NZ now and intended to take this trip (and its a great trip) and could not get a Senior Citizen rate, I would pass it up, and I am sure that other senior visitors may well do so. I am due to visit my family in NZ in December for 6 weeks (my eighth trip to NZ) and have already booked many trips whilst there including a flight down to the South Island, and I am very pleased to say that other than the hotels, almost everywhere that I have booked offered senior citizen fares, not even asking if I was an NZ national, they were only too glad of the business. I am sure that Kiwi Rail feel the same?? The new website of Kiwi Rail is very confusing – beautiful pictures but zilch on the fares structures! I wanted to book two trips (CHC to Picton and Wellington to AKL) for October for my husband and myself (Sr Citizens… from Namibia…) but gave up after erring around the website for 20 minutes without finding any concrete info. Who knows, someone from Tranz Scenic will reply and clarify? My wife and I are From Tassie, (The beautiful Island on the other side of the Tasman Sea) and we have visited the South Island twice in the last few years, we have travelled from Greymouth to Christchurch both by bus and by the Tranz-Alpine, and enjoyed both immensely. The Tranz-Alpine offered an experience and perspective that we could not get from the road trip and we enjoyed it immensely. We joined the happy throng out in the observation carriage and have many beautiful and memorable photographs of our journey. As a bushwalker who has lost the ability to hike the distances I used to hike, I am thrilled to be able to see these areas by any means. We would certainly do the trip again when/if we ever get the opportunity, and negative reviews would not have swayed us anyway because it’s all about personal experience, and in NZ we certainly got the best wherever we went. Travelling by train across the Southern Alps is well worth the visit from Christchurch to Greymouth. It’s all a great trip, either in winter or summer. There is a real sense of fresh mountain air and the vastness of the mountains not seen by the highways is great so I recommend it. The TranzAlpine is very famous, I think its considered one of the best day trip trains in the world and certainly New Zealand. Trains in Australia are fairly bland in their journeys by and large with the exception of the odd one or two of Queensland Rail. Sure there are cheaper options like rental cars and buses but hey some trains in the world cost $1000 or more and they’re boring! We found some great prices at http://www.nzbyrail.com and they were better than travel agents when we compared and NZ Railways themselves but each to his own. Special tip for the train – take a good camera and warm jacket so you can enjoy the brisk alpine air on the viewing deck of the train! I thought the trip was extraordinary, but whatever you do or wherever you go in NZ, be prepared to pay. Most of the time…you’re ripped off. Maureen Gottschling – I’d have to disagree with you there. Yes, prices in NZ are a bit more expensive at the moment compared ot other parts of the world, but that’s partially due to the high exchange rate which is itself directly related to the fact that the the US Dollar, the Euro and the Pound are all in the financial toilet at this point in time. Also, there will always be price variations between countries but food prices in NZ are not too dissimilar to those in Europe/UK, and their petrol price is much cheaper. Maureen’s comment is unfair… Brian’s is more measured. ‘Most of the time you’re ripped off’ is pejorative… even insulting. One wonders what Maureen was expecting from her holiday. Overall, New Zealand transport and tourist operators are no better or worse than any other country with a comparable industry and product. After they factor in their costs, the profit is set at what they think the market will bear. The fact is, the market for travel on this train is a strong one. Yes, I think too – both news here the one from Neerav Bhatt and the one from Maureen are very unfair. I was in NZL too and took the train Christchurch – Greymouth and enjoyed it very. The ride is its money worth. If anyone wants to have all the pleasures of travelling for low money then he should find a new world. Each thing has its price. But to comment that these or that is to expensive or wasted money is unfair and the commentator should think about his words. I knew no-one who ride these train and gave such a comment. The TranzAlpine is a highlight of the Southern Alps with or without the comments from Neerav Bhatt and Maureen Gottschling. Think about it and do the trip – it’s never wasted money. Ha! Was searching for Tranzalpine coupons and had to chuckle when your blog post came up in position #5. We’ve done the Tranzalpine a few times – it is much more scenic in Winter and the best part is from Arthur’s Pass to Greymouth. Sounds like you missed the best bit Neerav! But I agree, Arthur’s Pass is well worth a stop. We had friends who owned a bach at Moana – also worth a stop – a magical place on the shores of Lake Brunner. This person must be insane to say that this trip is not worth it. I have ridden the Tranz Alpine over 30 years and can honestly say that the service has improved every time I have ridden. If you are planning on bumming around NZ, you probably won’t take this train, but you will be missing fantastic views of the Waimak Gorge on a narrow gauge track that really makes you wonder how the train was able to provide regular service to the west coast. Greymouth used to be the end of the earth as well but even that destination has greatly improved. Our next trip will be CHC to Arthurs Pass for overnight B&B then on to Greymouth for overnight or a couple days on the west coast and then train back to CHC. Really looking forward to another run. I travelled on the Tranz Alpine scenic railway recently with friends and loved the experience, staying overnight at a farmstay outside of Greymouth and returning to Christchurch the next day. We were lucky to get two completely different views as it had snowed overnight so the return journey offered a new perspective. I made good use of the open carriage for photography but even the view through a wet window was magnificent enough to inspire a few of my newer paintings. I’ve actually done an article on the benefits of doing the TranzAlpine railway journey vs seeing the same sights from the seat of a car. I very much enjoyed doing the railway journey and viewing the sights from the open-air carriage, however, it was also great to have the freedom of the self-driven tour to stop wherever I wanted to, just to enjoy the views along the way at my own pace.